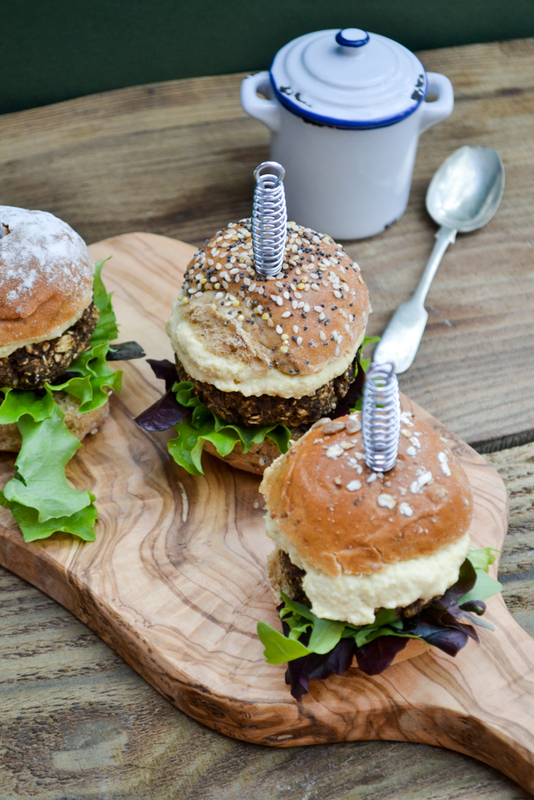 I love homemade burgers and sausages, they're so easy to make and much nicer than those bland frozen lumps sold in supermarkets, although I do admit to resorting to them from time to time when my boys are hungry, craving burgers (or sausages) and I'm short of time. I just leave them to get on with it and finish what I'm doing. I'm sad to say Graham's skills in the kitchen are basic and Cooper has gone off the idea of cooking, although he does love to bake. I make burgers more than sausages, I don't know why as they are made exactly the same way, the only difference is the shape. 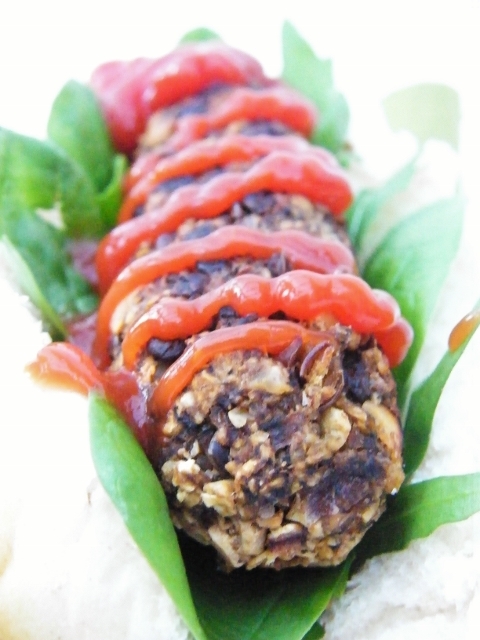 I served these puy lentil and mushroom sausages in finger rolls with salad leaves, cucumber, wholegrain mustard and ketchup. My boys loved them, especially my husband, whom I caught mid bite (see above). What do you top your sausages with? Do you like the traditional mustard and ketchup or something fancier? The main ingredients of these homemade vegan sausages are ready-to-eat puy lentils (I always have some in my store cupboard), mushrooms, sundried tomatoes and roasted peanuts. Onion, garlic and mushrooms are cooked in a little oil, seasoned, then whizzed to a paste. After that, it's just a case of mixing all the ingredients together in a bowl, shaping them into sausages, then chilling or freezing them until you're ready to cook them. I told you they are quick and easy to make. 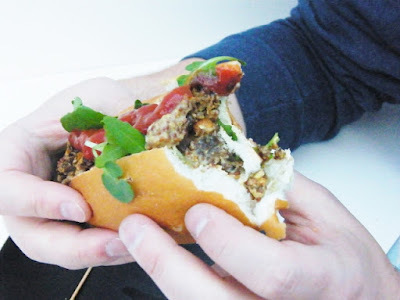 A really simple and quick recipe for the most satisfying and delicious vegan sausages. Chill them until you need them, they happily sit in the fridge for 2-3 days or freeze them and always have a quick meal to hand. 1. Saute the onion and garlic in the olive oil until soft, then add the mushrooms and cook until they are tender and juicy. Season with black pepper. Whizz in a food processor, blender or with a stick blender into a fine chop or paste.2. In a large bowl combine all of the ingredients, mix well with a wooden spoon, then take scoops of the mixture and shape into sausages. You should get 6 good sized sausages out of this mixture.3. Pop the sausages in the fridge for at least 30 minutes to chill. This will help them to hold their shape while cooking. If you are in a rush you could try cooking them straight away, but they may not hold their shape as well. A burger shape is better when you want to cook straight away.4. Cook in a frying pan with a little oil until browned and crunchy on the outside and cooked all the way through. You can also cook these in the oven for about 20 minutes, if you prefer.5. Serve with on a finger roll with salad, mustard and ketchup or for a more substantial meal with mash and gravy. Or why not cook some up on a Sunday morning as part of a cooked breakfast?6. Enjoy! Follow my Burger Love Pinterest board. Go on do it! Funny how we all go for burger shapes, isn't it. I'm now in the mood for bangers and mash. First if all I love that you have a burger Pinterest board! And I don't make many burgers, and I rarely, rarely make sausages but those looks great, Jac. The roasted peanuts are a great touch. Nice Graham-as-hand-model pic too ;-). Lastly, yes to caramelised onions and a touch of just-grated horseradish if available. Well I have two men in my life who love burgers and sausages so it's a big thing in this household and homemade are always so much nicer. Oh yes, I love horseradish too! Mm, looks quite appetizing in the hot dog shape! You know me Jac, very partial to veggie options. I love lentils and mushrooms, in fact I love everything about these. Can you make me some please? Awww, you'd probably not taste them while you are in. Soup's what you need. I hope David is looking after you. That option is out for me, with my vegan, but really they don't need egg at all. Lower calorie and fat too without it. I've only made glamorgan sausages before, but these look scrummy and easy to make ahead to save time in the evenings. I've only ever made Glamorgan sausages too, these look so tasty. Thanks for sharing Jac, will be trying these soon. These look fantastic! I'd really love to try.